When couples divorce, frequently the court will order that life insurance be taken out on the party who is required to pay child support and spousal maintenance or alimony. This protects the party who is receiving the financial support, and assures that the support continues if the ex-spouse dies. But what if the party who is paying the support becomes disabled? Until now, there hasn’t been a way to ensure that divorce settlement and child support payments continue if the person making those payments — the payor — becomes totally disabled. Some people in white collar and professional/technical jobs may have disability insurance (DI) through work or may carry personal disability insurance. But it insures only a portion of their income, typically 40 to 60 percent. Many people don’t have any disability income coverage other than Social Security. So if the payor becomes disabled, continuing divorce settlement and child support payments to an ex-spouse, on top of paying their own bills, becomes difficult or even impossible.The payor’s only option has been to file for a reduction in the obligation based on current financial circumstances, which is costly and stressful for both the payor and the recipient. Now there is a better solution. Did you know that there is a disability insurance product specifically designed to help honor the divorce decree? It can pay most of the expenses dictated by the divorce decree (i.e., alimony, child support, children’s medical insurance premiums, tuition, school activity fees and expenses, etc.) if the payor becomes disabled. It makes sense to build this coverage into a divorce decree. Although the coverage is designed for those in white collar and gray collar occupations, coverage for those in blue collar occupations is possible, depending upon affordability and the terms of the divorce. The policy can be customized individually to meet the requirements of almost any divorce decree. The payor is assured their obligations can be met stress-free should they become disabled, and the payee can rest assured that they will not have to worry about support payments stopping or lowering if the ex-spouse becomes disabled. Underwriting is modified guaranteed issue up to $1 million of obligation. Usually no exam or medical records are required. Obligations over $1 million likely will require some underwriting. Ideally, quotes for this coverage would be obtained and used in the negotiations between the divorce attorneys and then coverage would be put in place when terms are agreed upon. Who pays for the coverage can be part of the divorce negotiations. Divorce DI also may be obtained after a divorce is finalized. Interested parties may obtain a quote and coverage at almost any time, assuming there is no pre-existing condition. If coverage is obtained, the divorce decree will need to be modified to reflect it. If divorce DI is not practical, the payor should consider obtaining a life insurance policy with a critical illness rider. Some companies will allow for access to the death benefit should the insured suffer a heart attack, receive a cancer diagnosis or contract another serious illness. Even term insurance is available and with very affordable pricing. Divorce DI or life insurance with living benefits can make the difference when protecting the terms of the divorce decree. The divorce decree requires $5,000 per month of alimony, and child support is payable for 60 months. Alimony stops at the end of this period. During the next 60 months, $2,500 per month of child support is payable. Child support for the oldest child stops at the end of this period. During the next 36 months, $1,250 per month of child support is payable and then stops for the younger child. The payor is obligated to pay $20,000 per year of college expenses for four years, when each child goes to college. This is an additional $160,000 in total obligation for the two children. The cost of the children’s medical insurance is $500 per month. Here is how the policy payment structure works. When the policy is issued, the payor has an obligation of $5,000 per month for 60 months plus $500 per month in medical insurance premiums, totaling $5,500 per month. The policy is issued with a 90-day elimination period, so the payor will have to make the divorce settlement and child support payments from their own funds for the first three months. This reduces the total amount insured by the policy to $716,500. This breaks down to $733,000 (the payor’s total obligation) minus $16,500 (the amount paid by the payor in the first 90 days of total disability). As described previously, the policy has a 90-day elimination period and the payor continues to make the monthly payments of $5,500 for three months. So, the policy is written to pay $5,500 per month for 57 months, which is the balance of the payor’s $5,500-per-month obligation after the elimination period has been satisfied and the policy begins paying benefits. Because the $5,500-per-month obligation lasts for only 57 more months and the policy pays benefits for 60 months, the policy also would pay $3,000 for three months. 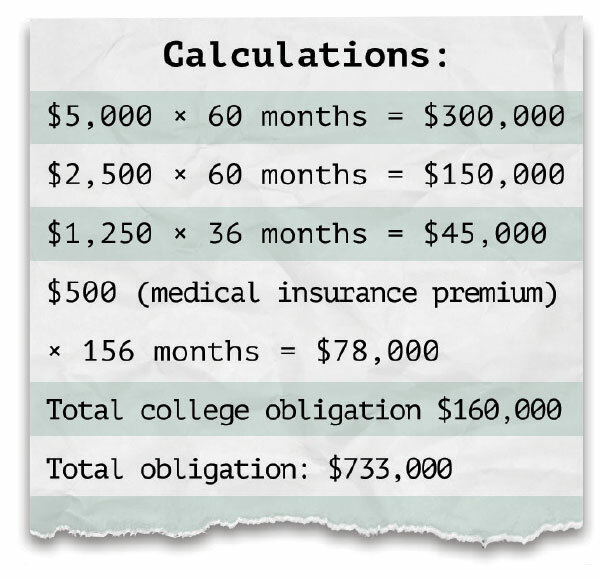 This breaks down to $2,500 child support plus $500 medical premium, beginning after 57 months. Assuming the payor is deemed permanently totally disabled from their regular occupation, the lump sum benefit, payable after 60 monthly payments have been made, would start at $394,000. This amounts to $716,500 total obligation after the payor has made the first three months of payments. 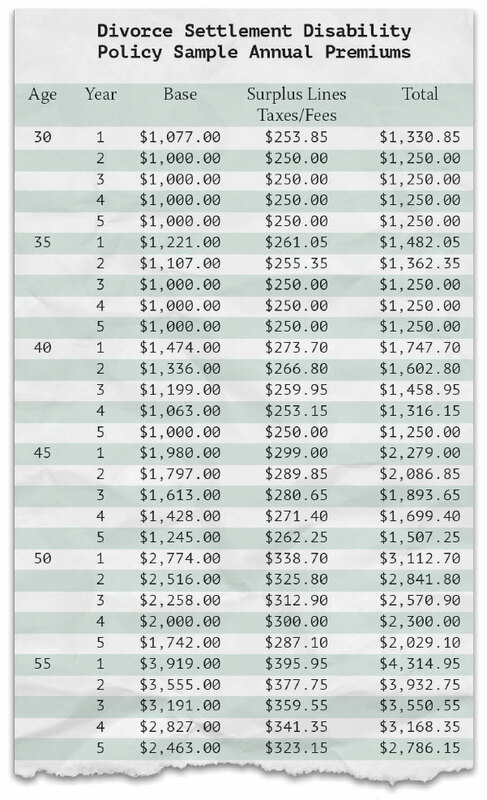 This breaks down to 57 months’ benefit multiplied by $5,500 minus three months’ benefit multiplied by $3,000. For every month in which the policy is in force and the payor makes the $5,500 payment to the recipient, the $5,500 monthly obligation is reduced by one month. So the policy’s monthly benefit reduces by one $5,500-per-month payment and increases by one $3,000-per-month payment (to maintain a total of 60 monthly benefit payments), and the lump sum benefit is reduced by $3,000. In month two, if the payor becomes disabled, the policy would pay $5,500 for 56 months, plus $3,000 for four months, plus a $391,000 lump sum benefit. In month three, if the payor becomes disabled, the policy would pay $5,500 for 55 months, plus $3,000 for five months, plus a $388,000 lump sum. In month four, if the payor becomes disabled, the policy would pay $5,500 for 54 months, plus $3,000 for six months, plus a $385,000 lump sum. A “benefit payment table” will be included with each illustration showing the maximum monthly and lump sum benefits payable over the term of the policy, based on the date of disability. The policy is a five-year renewable policy. So every five years, the policy is rewritten based on the payor’s remaining obligation. If the policy is no longer necessary because the obligation has been reduced to a level where the payor can “self-insure,” it may be cancelled. Premiums decrease every year, because the policy pays a reducing benefit. For each month in which the payor makes a payment, it reduces the remaining obligation to pay by the amount of the payment. The plan is designed with a 90-day elimination period and a term of five years minus one day. Year 1 benefits of $5,500 per month for 57 months plus $3,000 per month for three months (to pay for alimony, child support and medical insurance premiums). A lump sum benefit of $394,000 after 60 months (to pay for the balance of child support, college and medical insurance). The total initial insured obligation would be $716,500. A 54-year-old man is required to pay $22,000 per month in alimony for 11 years. The total obligation is just under $3 million. Similar to the first case study, premiums would decrease each year as the obligation is lowered. The initial annual premium to insure $22,000 of monthly income for five years followed by a lump sum of $1.5 million in the sixth year is roughly $13,200. The ex-wife should consider protecting her $22,000 of monthly income with a divorce DI policy on her ex-husband. Who pays for it can be negotiated. His attitude might be, “If I become disabled and need to go to court to ask for relief of payment, so be it.” But the ex-wife could fight that and demand that all financials be opened again. It could get ugly fast, and the stress and cost of going through the divorce all over again would reopen old wounds. Think of the complications if one is remarried or has started a new family. I think it is in both parties’ best interests to consider obtaining divorce DI coverage. This is intended to provide you with a general overview of risk and how to insure it with a divorce settlement disability policy. Because each divorce is different, policies may be customized to fit almost any divorce decree. Michael Smith is president of CPS Horizon Financial, a BGA in Milwaukee, and speaks on the topic of linked benefits and living benefits. Contact him at Michael.Smith@innfeedback.com. .